Noble Master Developer's Blog » “Age of Conquest: World” — Now on Android! “Age of Conquest: World” — Now on Android! The World Conquest edition for Age of Conquest is now available in the Android Market! The world edition features a mini map of the world (bigger maps are not possible due to memory limitations) including all the continents Europe, Asia, N. America, S. America, Africa and Australia. Scenarios ranging from modern times to futuristic times. 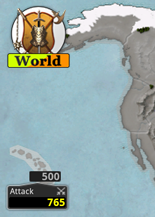 God mode option to see all the empires on the map. Simple building options including fortifications and watch towers. AI difficulty settings ranging from easy to extreme. Random placement and random fill options at game start. One game provides hours of entertainment. Background music matching the map and scenario you are playing. Management of income and spending as well as basic population and economy management. Diplomacy including alliances, peace treaties, cease-fires and vassalage. Loved the LITE version and purchased the WORLD version on the Android market, and it just wouldn’t download. After some google searches, it appears that at least one other person ran into the same issue. Unfortunately, I had to initiate a refund within my 15 minute refund limit. I want this, but can’t risk purchasing it again, and I pretty much have no options at this point. Usually a full phone restart (completely turn off your phone) fixes the problem. In any case, if you’d like to try again and it still doesn’t work, send me an email and I’ll give you a full refund. Please include your order# in the email. Generally, pretty much everyone is able to get the game to work but for everyone else, I’ll make sure they get a full refund. So when I ask about Xoom, I mean take advantage of the tablet features. The AI accepts diplomatic actions but only rarely at the moment. It’s on the to do list to fix!